The self-assembled hierarchical MnCO3/MWCNT nanoarchitectures are prepared by a facile solvothermal method and used as anode material for lithium-ion batteries. The results of SEM and TEM show that the hierarchical nanorods are made of the primary MnCO3 nanocrystals. The hierarchical nanorods MnCO3 are heterogeneously distributed among retiform MWCNTs. Those MnCO3/MWCNT nanoarchitectures are able to buffer the physical aggregation of the MnCO3 nanorods and volume expansion of MnCO3 in the charge/discharge process. The self-assembled hierarchical MnCO3/MWCNT nanocomposite delivers a reversible capacity of 704 mAh g−1 after 110 cycles at a current density of 100 mA g−1. 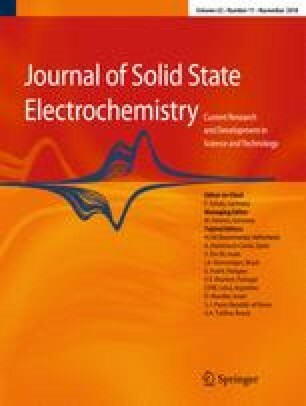 The excellent electrochemical performance is attributed to the self-assembled hierarchical MnCO3/MWCNT nanoarchitectures and the high conductivity of MWCNTs. This work was supported by the Scientific Research Program of Hebei Province (No. 16273706D), the Basic Innovation Team of Tangshan (2017).